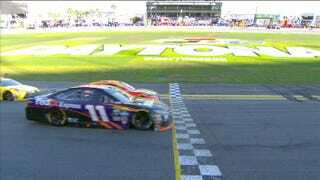 With an unpredictable pass and a finish that took it right to the checkered flag, Denny Hamlin took this year’s Daytona 500 win and made history with just how close the finish was. The Joe Gibbs Racing team as a whole finished the race near the front, which is what team founder and former Washington Redskins coach Joe Gibbs wanted all along—he’s talked about another Daytona 500 victory throughout Speedweeks, according to AP. JGR driver and 2015 champion Kyle Busch—who missed the last Daytona 500 due to injuries—finished third, while Carl Edwards came in fifth. The fourth JGR car, the No. 20 of Matt Kenseth, had the lead at the white flag and finished 14th overall. Hamlin passed teammate and two-time race winner Kenseth for the lead when the No. 20 dropped out of the draft in order to block at the front of the field. Not everyone had as great of a day as the JGR guys, as Hendrick Motorsports drivers Dale Earnhardt Jr. and Chase Elliott both took spins into the grass during the event. Elliott held the pole for the race and Earnhardt won his Can-Am Duel in dominating fashion, making him a favorite to win the event. Hamlin will head to the Sprint Cup Series’ next season stop at Atlanta Motor Speedway with a five-point lead over Martin Truex Jr. in the points standings, but those don’t matter much anyway with the new “win and you’re in” Chase system that NASCAR began using in 2014.